A distant view of Kudala Sangama temple, in Bagalkot district of Karnataka, India, the place where a renowned Kannada poet and revolutionist "Krantiyogi" Basavanna achieved his "Samadhi". Lingayatism, also known as Veerashaivism, began as a reform movement in the twelfth century C.E. India by Basavanna (1134 - 1196 C.E.). 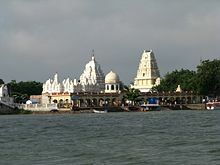 The adherents of the faith go by the name Lingayats or Veerashaivas. The term derives from Lingavantha in Kannada. Legend relates that Basavanna, though born a Brahmin, rebelled against the rigid practices of the caste system then prevalent, and eventually began expounding his own philosophy with a casteless society at its core. Although Basavanna rejected the social caste system, he embraced the principle of Karma and reincarnation. Additionally, he rejected the practice of treating women as inferior. That practice, although a reform, found strong support since denominations of Hinduism have a tradition of revering and worshiping female deities, and respecting women, especially mothers. Soon, his philosophy began attracting large numbers of people into the fold. Saints like Allama Prabhu, Akka Mahadevi, Channabasavanna also played pivotal roles in founding and spearheading the sect. The movement has made important contributions to Hinduism throughout its nearly 800 year history. That contribution includes the creation of a body of teachings aimed at the common person in India, strengthening the civilization of southern India. India after independence in 1947 has made enormous strides in creating a society of equality among the castes. Much of the credit of that success goes to Lingayatism's staunch efforts to overcome caste in India. 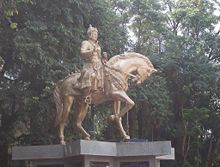 Basavanna lived and taught in the northern part of Karnataka State. The movement found its roots during the brief rule of the southern Kalachuri dynasty in those parts of the state. Traditionally, Basavanna has been considered an incarnation of Nandi, Shiva's greatest devotee. Another school of thought maintains that Basavanna only brought about a renaissance in an already existing sect. They attribute the founding of the sect to the mythological Panchacharyas (Five Teachers). The Panchacharyas consisted of Sri Revanaradhya or Revanasiddha, Marularadhya or Marulasidhdha, Ekoramaradhaya or Ekorama, Panditaradhya and Vishwaradhya. That theory lacks historical evidence and Basavanna has been widely believed to have founded the sect. Reconstructing the historical context, origin and development of the Lingayat faith, requires drawing upon several sources. The various sources employed include folk literature, inscriptions, historical facts, post-Basava developments, the Vachanas, reminiscences, Ragale literature, the lingayat and Jaina puranas and the doctrinal and philosophical works like the Shoonya Sampadane. Reconstructing the origin and development of the Lingayat faith across time and space requires a holistic and comparative study of all those sources. Of all the sources, the epigraphical evidence stands out as particularly important. The Arjunavada inscription in particular establishes the historicity of Basava beyond dispute. The Vachana literature, especially the vachanas composed by Basava himself stand out as critical in this study. Harihara's Ragale constitutes yet another invaluable source. Lingayats believe in a monotheistic world, called Shakti Vishishtadvaita, where Shiva the supreme god and self are one and the same. Unlike other Hindus, Lingayats place little importance on the Vedas, focusing more on the Hindu Agamas, specifically, the Shaivite Agamas. Some Lingayats view the Vedas as polytheistic in nature while the Agamas maintain a strict monotheistic and devotional nature. Veera Shaivism's means of attainment depend on the concepts of Panchāchāra (five codes of conduct), Ashtāvarana (eight shields) and Shatsthala central to Lingayat theosophy. The Shatsthala refers to the different levels of attainment that the devotee can achieve to protect the body as the abode of the Lord. Lingāchāra - daily worship of the personal Sivalinga. Sadāchāra - attention to vocation and duty. Sivāchāra - acknowledging Shiva as the one God and equality among members. Bhrityāchāra - humility towards all creatures. Ganāchāra - defense of the community and its tenets. The Ashtavaranas shield the devotee from extraneous distraction and worldly attachments. The Ashtavaranas include: Guru, Linga, Jangama (wandering monk), Pādodaka (water from bathing the Linga or guru's feet), Prasāda (sacred offering), Vibhuti (holy ash created using cow dung), Rudrāksha (holy beads) and Mantra (Namah Sivaya). Shatsthala or the concept of six phases/states/paths has a pivotal role in Lingayat philosophy. Shatsthala constitutes a conflation of Shat and Sthala, meaning 'six phases/states/levels' through which a soul advances in its ultimate quest of realization of the Supreme. The Shatsthala comprises the Bhakta Sthala, Maheshwara Sthala, Prasadi Sthala, Pranalingi Sthala, Sharana Sthala and the Aikya Sthala. The Aikya Sthala culminates when the soul leaves the physical body and merges with the Supreme. While the origins of the Shatsthala may be traced to the Agamas, particularly the Parameshwaratantra, with the evolution of Veerashaivism, the concept of Shatsthala also developed. While Basavanna understood Shatsthala as a process with various stages attained in succession, Channabasavanna, Basavanna's nephew, deserves the credit of refuting that and redefining Shatsthala. Channabasavanna differed radically from his uncle and held that a soul can reach its salvation in any stage. Lingayats believe in a monotheistic world where Shiva stands as the supreme God and the self and Shiva are one and the same. That form of monotheism, called Shakti Vishishtadvaita, presents a fascinating concept of God. The Istalinga worn by the Veerashaivas on their body represents a miniature of the Sthavaralinga worshiped in the temples. 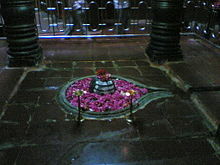 The Sthavaralinga, also known as Shivalinga, is an amorphous representation of Shiva. Channabasavanna, Basavanna's nephew and one of the foremost Shivasharanas of the twelfth century. He along with Basavanna, Allama Prabhu and Akka Mahadevi played a pivotal role in the propagation of the Veerashaiva faith. He also wrote the Karana Hasuge one of the most sacred texts of the Veerashaivas. True union and identity of Shiva (Linga) and soul (anga) represents life's goal, described as shoonya, or nothingness. 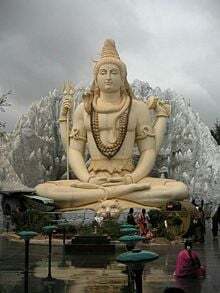 One merges with Shiva by shatsthala, a progressive six-stage path of devotion and surrender: bhakti (devotion), mahesha (selfless service), prasada (earnestly seeking Siva's grace), pranalinga (experience of all as Siva), sharana (egoless refuge in Siva), and aikya (oneness with Siva). Each phase brings the seeker closer, until soul and God fuse in a final state of perpetual Shiva consciousness, as rivers merging in the ocean. The Anubhava Mantapa, an academy of mystics, saints and philosophers of the Veerashaiva faith in twelfth century Kalyana, constituted the fountainhead of all religious and philosophical thought pertaining to the Veerashaivas. The mystic Allama Prabhu presided with numerous Sharanas from all over Karnataka and other parts of India participating. That institution became the fountainhead of the Vachana literature used as the vector to propagate Veerashaiva religious and philosophical thought. Other giants of Veerashaiva theosophy like Akka Mahadevi, Channabasavanna and Basavanna himself participated in the Anubhava Mantapa. The Anubhava Mantapa originally had been called the Shivanubhavamantapa. Saguna means one who has Guna or characteristic manifestations, a way that leads to Saguna Upasane, accomplished by engaging our senses like eyes to watch Abhisheka, ears to hear Sthotra and Mantra, and tongue to chant. Nirguna means one who has gone past all attributes. When a person follows the Ashtavarana for the body and Shatsthala for the mind (those gradually convert a person from Saguna to Nirguna) will lead self to rise and reach nirguna state. This way leads to Nirguna Upasane. The Lingayats make it a point to wear the Ishtalinga at all times. The Istalinga, comprised of light gray slate stone, has been coated with fine durable thick black paste of cow dung ashes mixed with some suitable oil to withstand wear and tear. That makes a coating called Kanti (covering). Occasionally, the crafts person mixes ashes with clarified butter. The Ishtalinga has been occasionally mistakenly likened to a miniature or an image of the Sthavaralinga. The Ishtalinga on the contrary, devotees consider the Ishtalinga as Lord Shiva himself, its worship called Ahangrahopasana. Thus, for the Lingayats it constitutes an amorphous representation of God. Lingayat thus means the wearer of that Linga as Ishta Linga. Here the word Ishta, a Sanskrit term, means 'adored' or 'desired'. Unlike Advaitins, Lingayats treats the Ishtalinga as more than a mere representation of God to aid in realizing God, but as the worship of the Ishtalinga itself as God. Similar to most brahmins, Lingayats maintain strict vegetarianism. Lingadharane refers the ceremony of initiation among Lingayats. Usually performed when a child reaches three to eight days old, the baby receives Istalinga from the family Guru worshiped until age eight to eleven years of age. Usually between the ages of eight and eleven years, the child receives Diksha from the Guru. From then on, the child wears the Linga at all times for the remainder of her life, worshiped as their own Istalinga. The child keeps the Linga in a small silver and wooden box and cloth, wearing it on the chest or around the body using a thread. Unlike other Hindu sects, which permit upanayana only to only males, Lingadharane stage the ceremony or deeksha for both men and women in presence of a satguru. Revolutionary Basavanna started that practice, refusing to undergo upanayana upon seeing the discrimination of women. Kaayaka means the exertion of the Kaaya (body) for the liberation of the soul imprisoned therein. Kailaasa means the heavenly abode of Shiva. Kaayakave Kailaasa literally means, Kaayaka or the body which exerts itself for nishkaama Karma. Karma without any expectation means Kailaasa or the heavenly abode of Shiva. Some advance that the Vindhya mountain ranges divide the Indian subcontinent into North and South. The Himalayan rivers flowing all through the year, and sacred Ganga bless the North. The Kaveri river, which originates at Talakaveri, dries up in summer in the South. In the North, referred as Punya Bhoomi, residents believe taking a dip in Ganga with Bhakti will wash off all your sins. But in the South, referred as Karma Bhoomi, residents believe their Karma will decide their fate. The Kaayaka Tatva of Basavanna also bases itself into Karma Siddhantha, the philosophy of Karma. For the devout Lingayat, Dasohaconstitutes an important injunction. Basava created it as a protest against the feudalistic ideologies present at that time. He shunned the sharp hierarchical divisions that existed and sought to remove all distinctions between the hierarchically superior master class and the subordinate, servile class. Even though he himself served as a minister under the king, Bijjala, he pointed out that he worked only as a daasohi or one who serves. Dasoha to him meant working hard for one's livelihood and for the maintenance of society. In Basava's view, a dasohi should consider himself, but a servant of society. Therefore, Dasoha in principle assumed that what belongs to God must return to Him and what came from society should be given back by way of selfless service. Basava exhorted all wearers of Ishtalinga to practice dasoha without reservation. Unlike most other Hindus who cremate the dead, the Lingayat bury their dead. They bury the dead in the Dhyana mudra (meditating position) with their Ishta linga in their left hand. The Aikya Linga, symbol of Lingayatism. The rise of Veerashaivism heralded a new chapter in the annals of Kannada literature. It saw the birth of the Vachana style of literature with the Veerashaiva philosophy at its core. The Vachanas, poems of devotional nature, expounded the ideals of Veerashaivism. Saints and Sharanas like Allama Prabhu, Akka Mahadevi and Basavanna stood at the forefront of that development. The entire corpus of those works, written in Kannada, marked one of the golden periods in the history of Kannada literature. As with the Dasa Sahitya of the later Haridasas, the Vachanas primarily targeted the common man and sought to demystify God as large sections of society had been deprived of access to the texts. The Jangamas played a central role in the propagation of the Vachanas. In contemporary history, Lingayats have lived throughout the state of Karnataka constituting Karnataka's largest community with twenty two percent of the state population and about two percent of the country's population. Sizeable populations live in parts of Maharashtra and Andhra Pradesh bordering Karnataka. Tamil Nadu and Kerala both have Lingayat populations. They go by the names Kashmiri Shaivaites or Veerashaiva in north India. In Karnataka, the Lingayat have a sizeable population living throughout the region. Today, the Lingayat diaspora resides in countries around the world, particularly the United States, Britain and Australia. The Lingayat community wields considerable influence in the sphere of Karnataka politics. Several important and powerful leaders have been from the Lingayat community. The Lingayat community, under the aegis of several Mathas, has been very active in the field of social work, particularly in the field of education and medicine. Thousands of schools, run by the Lingayat Mathas, provide education, sometimes free and with boarding facilities, for students of all sections of society irrespective of religion or caste. In addition, various Lingayat organizations run many schools, colleges and hospitals across the length and breadth of Karnataka. Some of those institutions also have branches in other states of India. ↑ Hebbani Madayya, Ke Kēśavan Prasād, and Si. En Rāmacandran, Male Madeshwara: a Kannada oral epic, as sung by Hebbani Madayya and his troupe. Literature in tribal languages & oral traditions (New Delhi: Sahitya Akademi, 2001), xiv. ↑ A. K. Ramanujan, Speaking of Śiva (Harmondsworth: Penguin, 1973), 63. ↑ Dattātreya Purohit and Shankar Mokashi-Punekar, Avadhoota gita (New Delhi: Munshiram Manoharlal, 1979), 63. ↑ Subramuniya, Dancing with Śiva: Hinduism's contemporary catechism = Śivena saha nortanam Sanātanadharmapraśnōttaram = Civan̲ō\DE\tu āṭutal Intu camayattin̲ tar̲kōla vin̲ā viṭai (Kappa, Hawaii: Himalayan Academy, 2003), 504. ↑ Gopa Sabharwal, Ethnicity and class: social divisions in an Indian city (New Delhi: Oxford University Press, 2006), 140. This page was last modified on 23 July 2018, at 15:33.